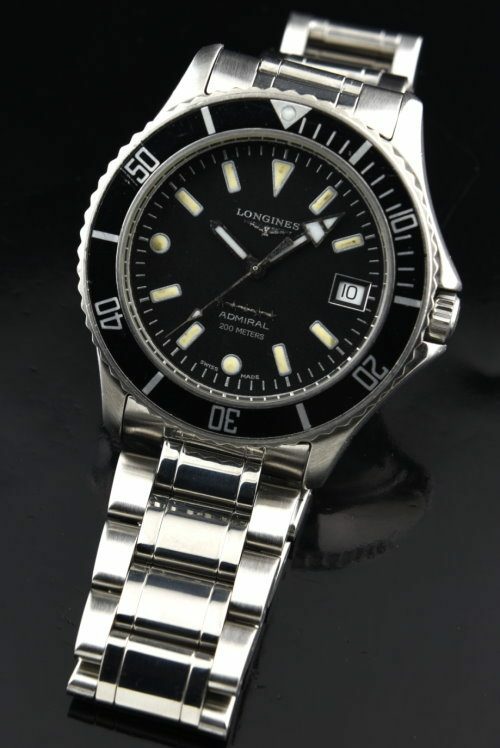 This is an uncommon modern (1997) LONGINES Admiral dive watch with box and papers. The stainless steel case measures 38.5mm. and the bracelet will fit up to 7.75 inches. The entire watch exhibits excellent condition overall. There are some marks on the bezel-nothing detracting. The dial is pristine. Those are 5 stars which are reflecting light on the dial and appear blurry…they are clear in person. The crown guard protects the screw-down winding crown. The automatic LONGINES movement is keeping accurate time. I believe LONGINES watches are undervalued and will one day have “their day”. This is a very fine and high quality dive watch. Just $1995.